We discovered this beautiful devotional on our FABULOUS trip to the cottage with our BFFs Ryan and Dana. Dana was so thoughtful and bought it for us that Christmas, and I read it daily for the next couple of years. I just recently picked it back up because it’s such an awesome way to start my day, and the messages are always so timely. God is so good and knows exactly what we need and when we need it. So cool seeing Him provide. 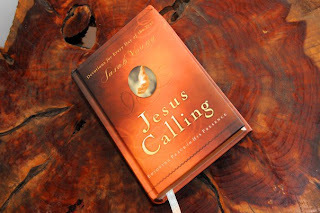 So….if you’re in the market for one, I highly recommend Jesus Calling by Sarah Young. Start your day with it. Look up the Scriptures it lists with each devotion. It will only take about 5-10 minutes and can change your attitude for the entire day. Here is a glimpse…..yesterday’s passage was awesome. This is my favorite devotional. Every morning I swear the Lord is speaking right to me :) My sister gave my mom and I a jesus Calling journal and it has a place to write your thoughts below. This Christmas we are going to look back and see how the Lord has used us and blessed this past year. Love it. Thanks for sharing your herat in your last post as well. I'm going to go get it from the library today! I received that devotional as a gift for college graduation from my church but I haven't taken the time to read it.....perhaps this is a sign! Thanks for the post!